James Cameron’s Avatar movies are coming to New Zealand, after the government signed off on an incentive package featuring tax breaks, documentaries and red-carpet events. Earlier this week, in a joint announcement, the Prime Minister John Key and the international film director James Cameron confirmed that the next three Avatar movies will be filmed in New Zealand, and the production would qualify for a tax rebate of 25 percent. The rebate is granted is part of the Large Budget Screen Production Grant and the Post, Digital and Visual Effects Grant, aimed at drawing high-level productions into the country and boosting the national film industry. The Green Party is claiming that the national assets sales are a means of funding tax cuts for the highest-earners in the country. In a press release issued on December 2nd the Green Party has claimed that the revenues raised in the recent sale of national assets has yielded less revenue than the tax cuts provided to top earners over the last few years. According to the Green Party, since 2009 and 2010 when the top marginal tax was cut from 39 percent to 38 percent, and from 38 percent to 33 percent respectively, the cumulative reduction in tax collections from the top 10 percent of earners is nearly NZD 4.5 billion. 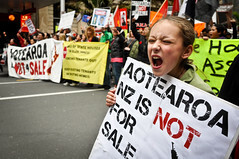 Conversely, the projected revenues from the sale of government-owned assets is expected to only reach NZD 3.9 billion.